05.01.2010 Small update to hide the “OK-button” if the “keyIsNotUniqueCount” is greater than 0. 25.11.2009 Small update to the script for placing the image correctly when used with the headings script. This will work with fields of type “Single line of text”, “Multiple lines of text (Plain text)” and “Number”. Note that if you activate this feature for a field of type “Number”, it strips off all other than numbers 0-9. No spaces, commas or periods are allowed. This is done to avoid conflicts based on different formats used in different language settings. 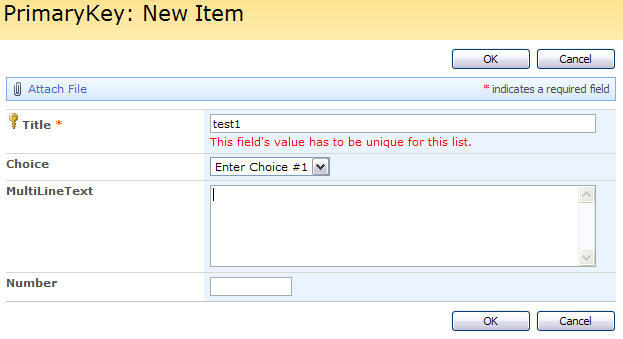 You can enable this feature for more than one field in a list or document library. Note: This does only work in NewForm and EditForm, not if edited in DataSheet. The sourcecode for the file “PrimaryKey.js” is found below. The last file in this screen-shot is the . Right click on the image and select “Save picture as”. 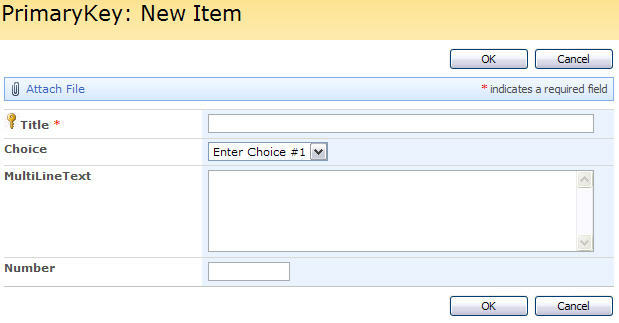 Add a CEWP below your list-form in NewForm and EditForm. // Enables "Primary key" on the "Title-field"
If used with a field of type “Number”, the code strips away spaces, commas and periods as described above. PrimaryKeyViolationWarning: [optional] The text shown under the field if the key is not unique. keyImageSrc: [optional] Image source for the “key.image” added before the field label. If not supplied it default’s to “/_layouts/images/prf16.gif”. PrimaryKeyHoverImageText: [optional] Description text if hovered over the “key-image”. // Enables primary key for the "Title-field"
Save as “PrimaryKey.js” and upload to the “script-library” as shown above. This is not a “guaranteed” primary key, as it does not work in datasheet-editing, and I’m sure someone finds a way to trick it. I’m nevertheless confident that someone can make use of this code. Let me know if something is unclear. Unfortunately I didn’t find the way to have it work with dropdown instead of textbox. In case you know the way I would be very grateful. You realize that if you hook this up to a dropdown you can have no more items in the list then the options available in the dropdown? The script does not permit duplicate values and hence a dropdown with 20 options would restrict the total number of registrations in the list to 20. Hi I tried the same and followed the steps but nothing happen. Image also doesn’t appear and messages also doesnt display. Please let me now this is very urgent. Sorry for the late reply, have you figured it out or still having trouble? I am trying to implement this code, but its not working for me after i have done all the steps. I tried to debug, but some issue was there in the PrimaryKey.js file , at the init_fields(). It is not loading the FieldInternalName. Have you placed the CEWP below the list form webpart? Hey A, Hope all is well. I have a delimma. With the fabulous 40 templates being phased out with the release of SP 2010 I am losing the room reservation template, which offers the functionality to prevent double booking of resources. Of course I have turned to your site and began looking at this primary key script. I thought at first I could build a CC to add several fields, building the Unique key. but I see the script needs the field onblur event. Is there a way to check a combination of several fields for a calendar list that builds a string of the title, location, start date and length. I know it wont be a perfect solution, but is there some way to have this work on a calendar, or do you know of a solution out there I could work with? I have found some neat features in the 2010 release that may work, but for now I am in limbo. Still searching or found a solution?